It was hard for me to add this blog topic this week. The tragic events at Sandy Hook Elementary School have left me despondent and disheartened. However, maybe a little music and craziness – the good kind – will put a little smile in our hearts and on our faces. A little one. So, in the spirit of the season and with gratitude for my happiness and good health, let’s reconnect via NBC’s The Voice, shall we? The Performance Finale airs from 8:00 – 9:30 P.M. on Monday evening and the Results Finale from 8:00 – 10:00 9:00 – 11:00 P.M. on Tuesday evening. 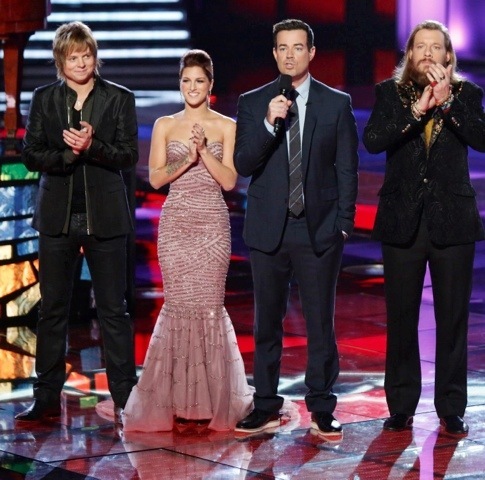 Enjoy the show everyone and good luck to the Top 3 – Terry, Cassadee and Nicholas. as they started singing ‘halleluiah’, i thought, ‘oh no, please don’t’, but that turned out to be really wonderful. i thought they did it with class, i loved the voices (christina kind of oversang), and then ‘went to black’, not saying a word, perfect! i thought, ‘how can they transition from this?’. they did it!! i actually liked terry best tonight. i’ll assume cassadee will win. I actually thought Christina was the best. Bit, overall, it was a beautiful tribute to those angels from Sandy Hook. Nicholas, for me, was incredible and gave three distinct performances. All were impeccable but, unfortunately, he won’t win. It is Cassadee’s win I believe. I loved the tribute…very beautiful. While I liked the show last night…I don’t think it was outstanding! I really have no idea who will win! I just want to say again about the tribute…What a beautiful way to pay tribute, it was very heartfelt! Vonnie – I thought Nicholas and Cassadee were exceptional but Terri faltered. The tribute was just, just beautiful. BEAUTIFUL! Adam hinted that something went wrong for Terri (in-ear monitors? sound? mic?) and that he recovered well. Any idea what that was about? I thought the tribute was exactly what was needed; what I needed anyway. Very thoughtful yet simple. Just right. I agree with that Christina voice and style was nice and a standout in this group and though she stood out, she was restrained from her usual style. I think Carson might have been the most touching of the group because he doesn’t normally sing and you could tell he looked to the others for cues and seemed a little uncomfortable, but he still wanted to be part of it. At first I thought “what was he thinking” when Nicholas announced his song choices, but when he hit the stage and I felt that big, dumb smile that comes uncontrollably on my face whenever he performs, and even more so when he rocks out like he did last night, I knew that he made the right choice. He could have wrung our hearts out like a dish rag but chose instead to entertain us and raise our spirits and I’m glad he did. His duo with Cee Lo was a perfect choice for them as well. “Hey now.” BTW, check out the preview of Cee Lo’s “Mary did You Know” on iTunes next time you are there. I think you may be surprised. Cascade’s reprise song was also a good choice for just the opposite reason. She’s a trooper and gave a touching performance that you could see, as she left the stage, had taken a toll on her. She was pretty weak on the verses but good on the chorus of her duo with Blake. I thought Terry wasn’t having his best night either. He had the technical malfunction that accounted for the weak start on one song and to his credit, didn’t go “Brooke White” on us. Then his last song seemed to start the same way but there was no complaint of a monitor malfunction. It wouldn’t disappoint me too much if any of them won. Aside from their singing, each one has qualities that I would like to see in the winner’s circle. Nicholas, who is my hand down favorite which means he can’t win, is that odd guy who most people would skip over on a normal audition yet he has a great voice and an unconventional performance style that might just find it’s way in this new music market were in today. Terry, just because he is a person who is a foreigner or of foreign extraction and is climbing the ladder toward the American Dream. People in this group usually don’t make it beyond about 6th place in similar contest. Cassadee is a girl for anyone who hasn’t noticed and I would also like to see that the voters for this particular contest can overcome the typical voting pattern bias when they believe the girl is the best contestant. She has the right stuff to do very well although I don’t particularly enjoy her voice, I find her to be a very good performer. Gene…I liked Nicholas and Cee Lo’s duet too…loved the Cee Lo mini me!!! I thought Carson participating in the tribute was very touching! Vonnie, I had forgotten about the mini me. That was pretty funny. I looked at the iTunes ratings a litle while ago and it looks like it may be Cassadee, Terry and Nicholas, in that order. Why Oh Why! Is the finale really 3 hours? Huh? I thought it started at 9:00? Not even watching yet. It looks like an edited version of last night’s show for the first hour followed by the two hour finale. While that was not a nail bitter…it was as Gene said! Cassaddee may have won the title but in reality all three won in my book…Nicholas maybe a little more than the other two! I was impressed with his generosity to bring back fellow contestants to share the stage with him! Not sure how he will do as far as selling records, but if a warm gentle spirit is what sold albums, he would outsell them all…. Now on to the X-Factor finale….and then in just a few short weeks…Idol. Let the judges table, I mean, Competition begin!!!!!!!! I want tickets to their concert tour (if they have one?). See you there? With this year’s rules, the iTunes standings are clear predictors of the outcome. I like that they weight the votes derived from purchases higher than those derived from the other voting methods because those votes show real support in the marketplace for a performer and no one is going to buy more than one copy of the song. Because of that fact they give you the same credit for one $1.29 purchase as they would for dialing the phone ten times. I’m undecided if I like the weighting to only apply to the top ten. I’m not sure that I understand how they use the iTunes sales in determining the season winner but I think the method overwhelms the competition. The show had a lot of good content and was very entertaining. The coaches group song, Smokey and Nicholas, Peter Frampton (although I think he revealed Terry’s weakness). It seemed to me that Frampton’s appearance, as well as the girl’s group performance, were shots at the X-Factor. It’s always good to see Kelly Clarkson with her infectious smile and child like enthusiasm. It seemed like her last run was a “check this out kid” statement. It seems that Cassadee may well do like we talked about before and do a Nashville bossed pop thing. It would be a good fit for her. I think she could have a pretty good career. Carrie Underwood grew a lot after her win and if Cassadee works at it as hard as Carrie does, she could find herself at the top looking down. I really hope that we haven’t seen the last of Nicholas. He’s one of a kind and I enjoyed every minute that he was on stage. Where is everyone??? Come on, we got another finale to get through before everyone goes on Christmas break!!! Does the Voice tour? That would be a blast!!! Yes! I hope Nicholas becomes a busy member of the music industry! I think Blake is smitten enough with Cassaddee that he will be a large factor in her career getting a huge boost! So, is this two wins for Blake? I’m here!! I’m here!! Will put up the X Factor blog topic ASAP. Yes, Vonnie, that’s two wins for Blake. So that means next season, Blake will be the sought after judge, after two wins and having two contestants in the finale!!! Let me finish that thought…two contestants in this years finale!!! blake really does go with his heart when he chooses his team members which i really like, because he then really seems to help them more professionally, than the other coaches. gene: we mentioned this before about carson, and i continued to feel that way, i.e., the ‘liking him’ has continued building for me. and as i’d said before, it is because i see a genuineness in how he cares about those contestants. i’ve always wanted to mention this but didn’t: i was very interested in the band. they play a HUGE role. it wasn’t mentioned much, but some. several of those guys were part of mark burnette’s ‘rock star’ program, and there it was shown how integral they were to the whole performance of each singer each week. it isn’t a band per se, but rather, session guys who are available, and there were a number of them on both shows. i always looked for them. Do you remember how amateur Carson seemed in the first season? I didn’t care for him at all back then. He has really grown in this job and this year he seemed really comfortable with it. You can tell that he cares about the performers and that it’s not just a show when he hugs them or shakes their hands etc. I didn’t watch the “Rock Star” program so I haven’t seen these guys in the band before. But to me, live music isn’t optional on these shows. Neither is live singing, BTW. Those are the top two reasons why the X-Factor isn’t a good show. The band on the Voice does an outstanding job, as does Idol’s band. I agree that they play a huge role. I have always believed that the band leader is probably one of the most important judges these programs have. I bet they offer a lot of feedback to the real judges about how much each contestant brings to the table, contributes at the practice sessions, and how easy they are to work with in general. Have you heard any plans for a “tour” for the Voice contestants this year? This top ten would make a great live show. I didn’t think that there could be another host that could steal my heart like Ryan Seacrest but Carson Daly put an end to that. My goodness – he is a genius at what he does and has grown so much throughout the past three seasons on the voice. I still remember season one when he actually had tears in his eyes during the final show. He really is a generous giving spirit and I’m so glad that he has involved so wonderfully on the show. And Mark Burnett has done a phenomenal job with the show. His live band, yes, they’re probably, as you said, musicians from rockstar. Their contribution to the show cannot be overstated. I can’t wait for Season 4 to begin. Bring it on! Thank you so much for hosting us all, and putting up with me, another year Rosanne! You and this community make these shows so much more enjoyable. I’m looking forward to your AI Masterclass articles next month.